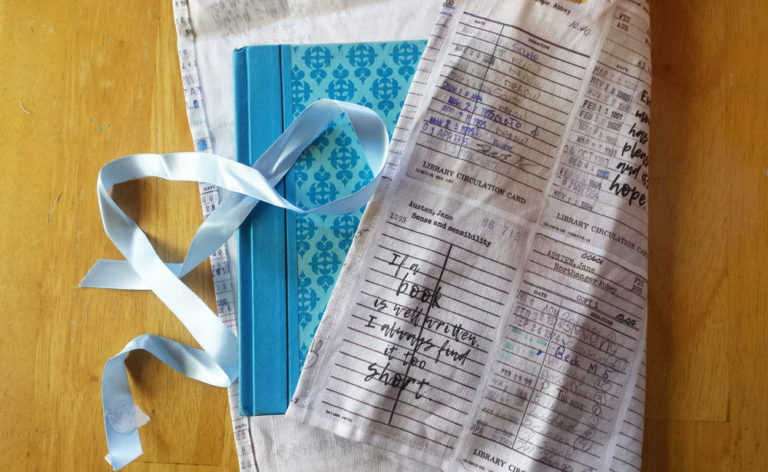 Spoonflower has 50% off on fat quarters for the next week (through November 8) – which means this is the perfect time to scoop up some tea towels for holiday gifting. 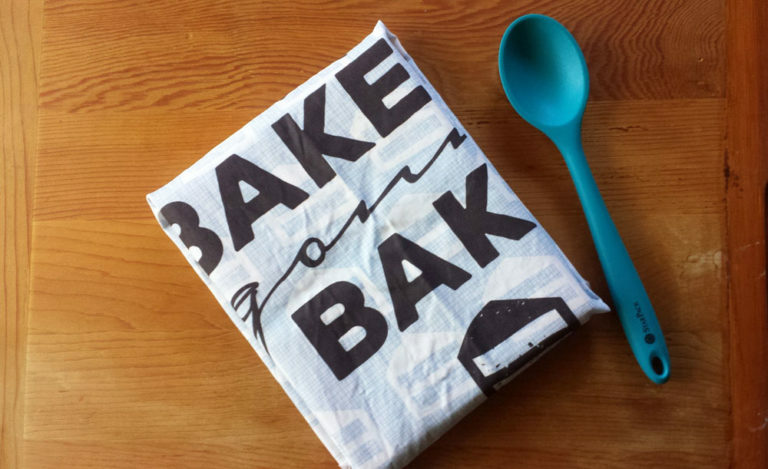 Better yet, pair your tea towels with a book, plant, baked goods or another item and use the towel as an eco-friendly wrapping – you’ll save the paper, and it’s like getting two gifts in one. Plus, if you start now, you might actually have time to sew up the towels before the holidays (unless you’re a really champion procrastinator like me, and then you’ll be hemming the night before your gift exchange). 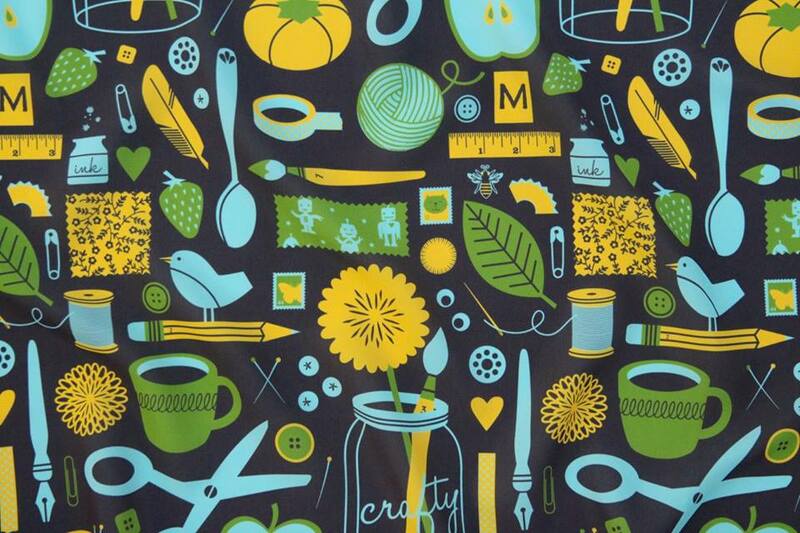 How about a martini shaker or a jar of olives wrapped in my Sylvia tea towel? 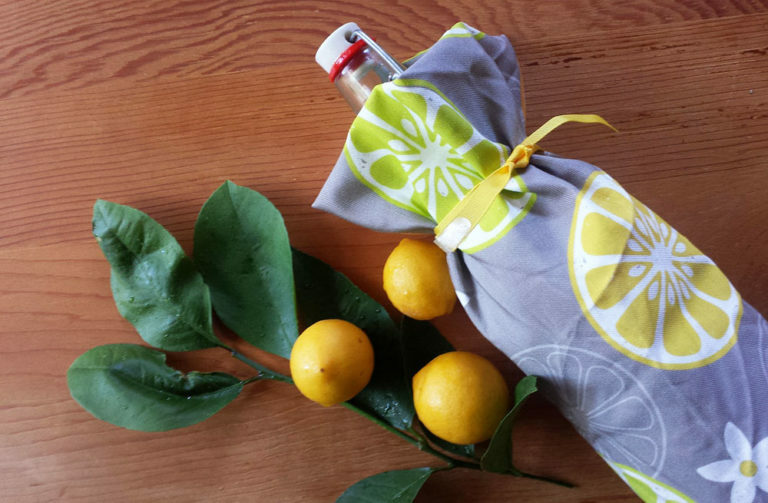 Speaking of furoshiki, there are a ton more furoshiki ideas, plus instructions for hemming your towels, on the My Poppet website. I put together a Pinterest board with examples of all the above uses plus a few more – check it out here. As you know if you read my posts or follow me on Instagram, I love to see what people make from my designs! Melinda of Weighted Works recently sent me a photo of a weighted blanket made with my Significant Otters fabric on the front and minky on the back – just looking at it makes me want to crawl under it and take a nap! According to Weighted Works, weighted blankets can help users feel more calm and relaxed, and can help manage the symptoms of insomnia, restless leg syndrome, autism, PTSD, nervous system disorders and anxiety. Sometimes I spend a ton of time carefully drawing a million details for a fabric or illustration…and sometimes I get a really simple idea that just works on the first try. “Bandage Stripe” was definitely the latter – it came together really quickly, but the colors make it special. And I’m thrilled that this design came in 2nd place in this week’s Medical Professions themed contest at Spoonflower – thank you to everyone who voted! 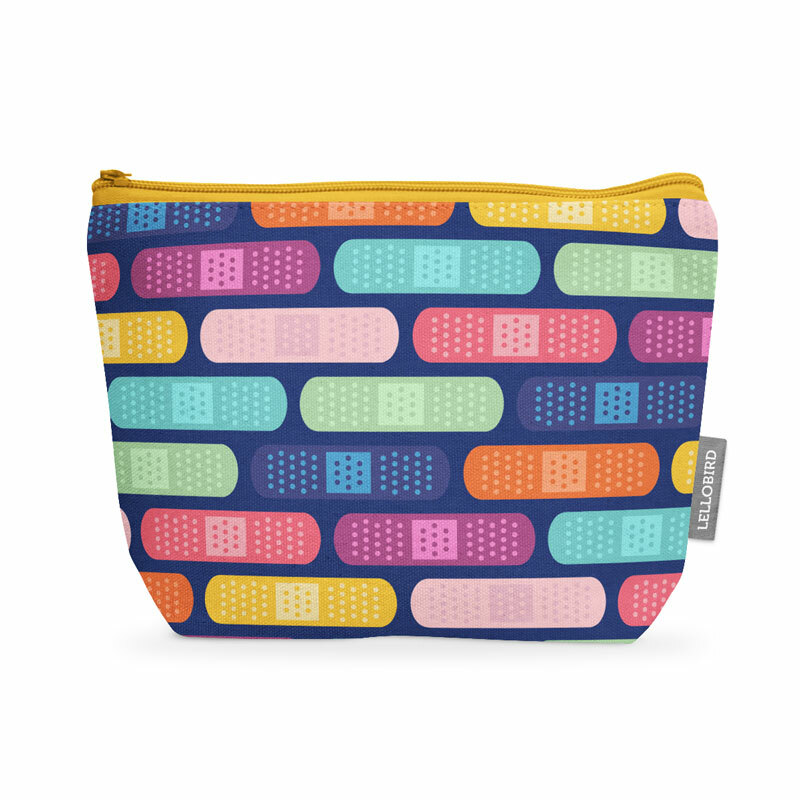 I can see this fabric making great scrubs, an ice pack cover or a fun pouch to hold your first aid supplies – because every 5-year-old will tell you that boo boos feel better when you have a cool bandage (or bandage-themed accessories!). Lellobird fabrics that raise money for charity, shown on mockups by Roostery. Rhinos seem like such tough creatures, but due to poaching and habitat loss, all five rhino species are threatened with extinction. The IRF works for the survival of the world’s rhinos through conservation and research. I especially like the way they partner with local communities living near the rhino populations – many of them struggling for survival themselves – so the locals benefit from conservation efforts, too. 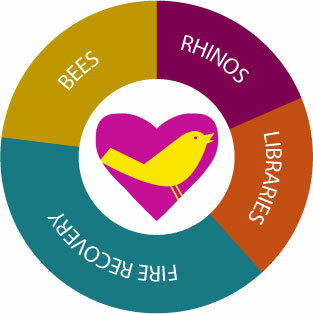 Sales of Rhinoce-roses and Rhinoce-roses Tiny (and products made with them at Roostery) benefit the IRF. As a life-long library user, a one-time library employee and a long-time library volunteer, I was shocked to learn that 30% of OUSD schools – including 14 of the 17 high schools – don’t have working libraries. FOPSL’s goal is to have an up-to-date library at every OUSD school in order to support literacy and “provide access to quality literature, information and technology to all OUSD students.” Sales of the Library Tea Towel Calendar (also at Roostery) benefit FOPSL. I created my Tea & Hope Tea Towel (also at Roostery) explicitly to be a charity item, with proceeds going to a different non-profit every six months. The first cause I chose was the fires that burned through swaths of Sonoma and other North Bay counties in October 2017, which were darkening the sky to perpetual dusk even at my home 60 miles away as I was designing it. The North Bay wildfires destroyed more than 8,900 structures and created problems both immediate and long-term for the area – officials estimate it will be 5-10 years before all the local infrastructure is rebuilt. We visited Sonoma recently and while the burn areas were sobering, it was inspiring to see signs everywhere thanking the first responders and confirming #sonomastrong. I split my donation between the United Way Bay Area Northern California Wildfire Relief and Recovery Fund, which is helping with both immediate and long-term needs, and the Sonoma County Resilience Fund, geared toward helping with mid- to long-term needs and rebuilding. For the first six months of 2018, the beneficiary of funds raised through sales of this tea towel will be the International Rescue Committee, which helps refugees and others suffering from humanitarian crises. Last but not least, bees! I’ve been a long-time supporter of Heifer International because I like their model of not just giving a hand-out but a hand-up, giving things that help people improve their lives and then encouraging them to share with their communities. Bees provide honey for food and also help pollinate crops, increasing yields. 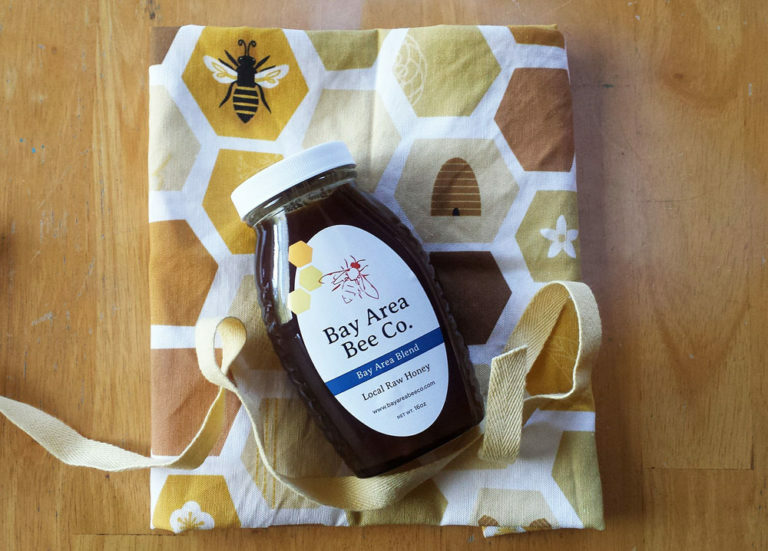 This year, sales of my Bee Towel tea towel (also at Roostery) helped purchase two sets of honeybees for Heifer recipients. None of these were huge donations, but they’re a start. Whether you can donate money or time, I encourage you to think about ways you can make your own corner of the world a better place in 2018, too. Cara from Kitty Curator emailed the other day to say she’d included my “Cats in Bloom” fabric in her recent post about cat fabric designs on Spoonflower. Thanks for the mention! 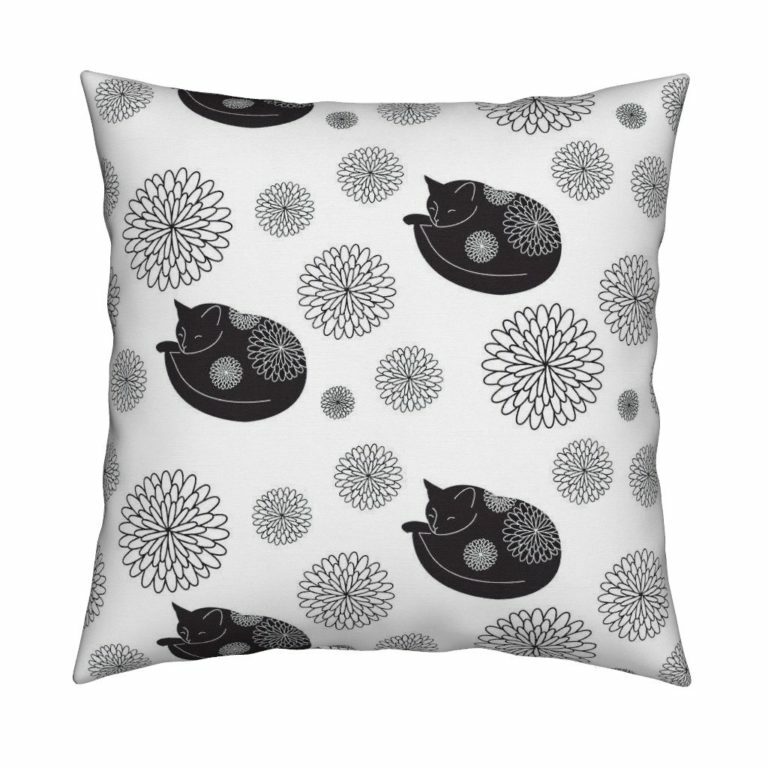 There are some really cute fabrics on the list – if you’re a cat fan, definitely check it out. Kitty Curator is a “blog about independent artists, designers & makers who create cat-inspired artwork and handmade goods,” in Cara’s words. Cats in Bloom was inspired by a black cat I used to own who was a complete sweetie, slightly clueless, the clumsiest cat you’ll ever meet, and a world-class purr-er. 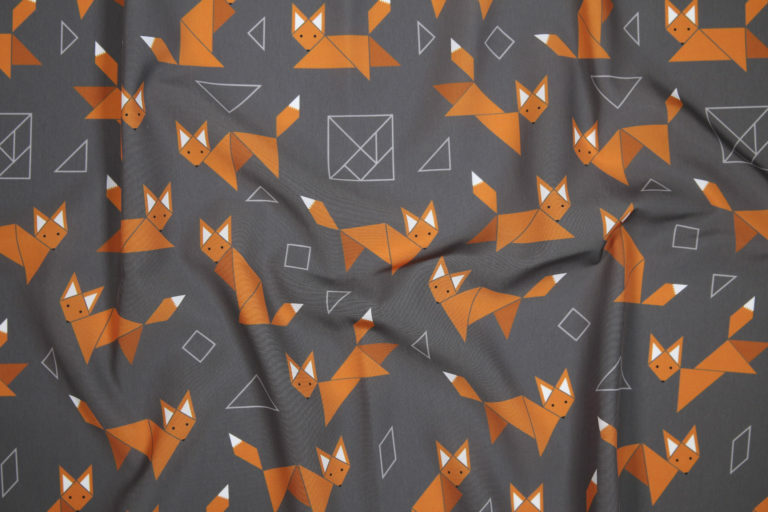 My Boxy Foxy fabric came in seventh in this week’s Spoonflower Tangrams contest – thank you to everyone who voted! It was fun and a little bit challenging to work with tangrams – they’re easy to draw, because they’re just geometric shapes, but I tried a few different ideas before I found a way to make them visually interesting. I enjoyed seeing how many images I could build with just simple shapes. 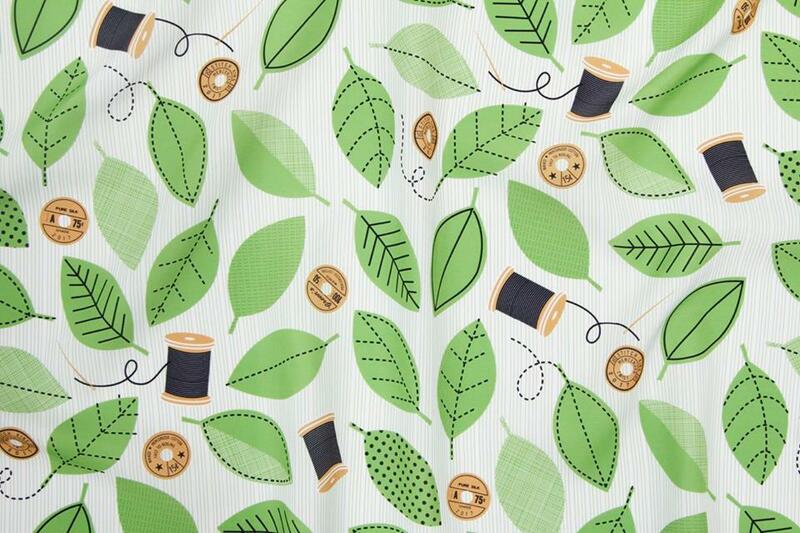 This week my design placed 4th in Spoonflower’s sewing-themed fabric challenge. I’m a bit of a geek about researching and recreating vintage-looking labels and ephemera, from record labels to library circulation cards. So it was fun to study old wooden spools and come up with my own take on them, combined with stitched leaves, for my Thread Garden design. This was a limited-color-palette contest, using Pantone’s Greenery color of the year, plus black, white and tan. I really like the fresh, spring green of Greenery. I got my start in online design contests doing tee shirts back in the day, so it was especially fun to merge tee shirts with fabric design in Spoonflower’s 2017 T-Shirt Design Challenge. It was tricky picking a 3-color scheme that would work on both light and dark shirts, but a lot of fun to think of all the things to put in my The Craftroom fabric, from spools of thread to googly eyes to a swatch of one of the first fabrics I designed at Spoonflower. I’m pleased to say my design came in 8th, against some very lovely competition. 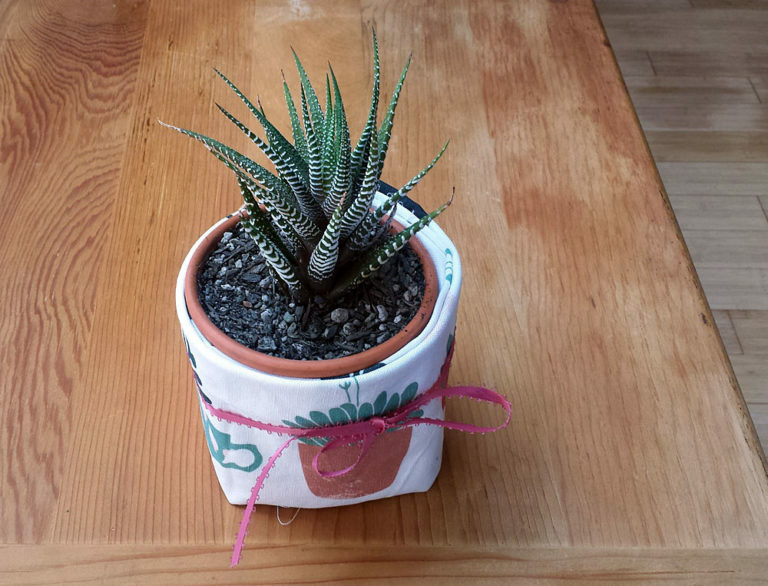 I’m already thinking about ways I can use all the bits and pieces from The Craftroom in other projects – you might be seeing that sweet little bird in a blockprint sometime soon! 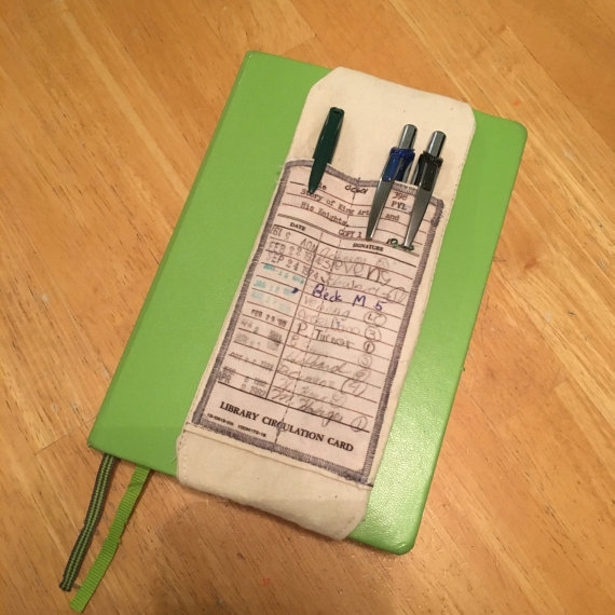 Yesterday’s Nerdist Home Geekonomics post about stocking stuffers featured a pen holder made by Door Number 9 out of my Old Friends library circulation card fabric. I’m consistently amazed (and pleased!) by how popular this fabric is — I think it taps into some deep nostalgia in this digital age — and love to see the things people make from it.